SharePoint: It's not your father's file server! Users in my organization are confused about whether to continue using file servers or to begin using SharePoint document libraries. Some users continue using file servers, while others enjoy the visual aspect of using a web browser to accessing files. I am new at administering SharePoint technologies and I am not sure what the right answer is. Like many solutions, there is no right answer that fits all situations. However reviewing some of the out-of-the-box features of SharePoint will help guide you in the pursuit of answering this question. Pound for pound, there's no question that it's cheaper and arguably faster to store documents on a file server. Let's face it. SharePoint adds the overhead of at least SQL Server licensing (for WSS3) and additional licensing for MOSS 2007. But file servers have been around for a long time. And from a user perspective the basic features haven't changed much in the past 15 years (or more). Basically, what you get is a directory folder tree. So what's in a SharePoint document library that makes it so compelling? At a conceptual level, SharePoint security is not all that different from file server security. The principal of security inheritance applies equally to file servers and SharePoint systems alike. SharePoint also comes with it's own grouping system. Why you ask? So that business (power) users and managers can manage their own security (if you are savvy enough to recruit someone for this). No longer does the IT helpdesk staff have to get saddled with permission management for every little nuance. All SharePoint security maintenance is done right in the web interface. On a File Server you get a folder tree, a file name, and some system columns like date modified/created, etc. In SharePoint, designers get to add their own custom columns. 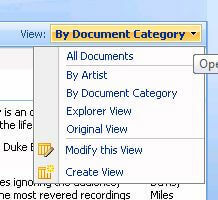 These can be used to create various 'views' of the same document library lists. Below are some examples. By default, document library listings are not any more exciting than using a file server. 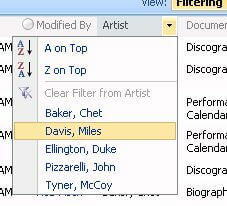 Notice the little funnel next to the artist column. This is to let you know filters are currently in use. Version Control - Every time a document is saved, a copy is made, saving both the original and new versions. Previous versions are available. The number of previous versions saved is configurable. Check In/Out - On file servers, depending on the application, you may get a little "this file is use, do you want to open a read only copy" message? With SharePoint, documents are controlled with a specific check in/out feature with a few configuration options. The best option is simply to display the check in/out status with name of the user a file is checked out to. Alerts - You won't file this feature on a file server out-of-the-box. SharePoint alerts allow a user to be notified by email when a document is added, changed or deleted. The notification can be immediate or it can receive a daily or weekly summary (per document library). All of these features (and more) are a compelling reasons to use SharePoint document libraries over a file server. But it's not all a bed of roses. Let's try to point out some of the down sides of using SharePoint vs. file servers. File Transfers - While one could argue that download speeds might be faster from a web server (SharePoint) versus a file server, copying large amounts of files, complete with folder trees is a lot more user friendly on a file server. SharePoint can offer more "control", which is what you would expect from a "Content Management" system. But it can also be cumbersome. Cost - In addition to hardware and an operating system, a production instance of SharePoint needs Microsoft SQL and a backup system that will do granular (item level) restoration of files. Also it needs an administrator/architect/designer (at least part-time). Check out some of the more advanced features of SharePoint such as Workflow, Content Approval, data connections, and more.